In April, the U.S. Centers for Disease Control and Prevention raised to 535,000 its estimate of the number of American children with potentially dangerous levels of lead in their blood. 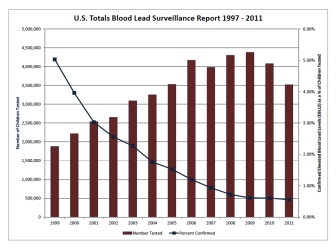 The number of children found to have high levels of lead in their blood has been declining nationally over the past few years. Iowa, too, has seen a decline. In 2008, 624 children were found to have high levels of lead in their blood, data from the Center for Disease Control and Prevention shows. That number dropped to 323 in 2009. This chart shows the number of children tested and the percent of those children who were found to have high levels of lead in their blood. PBut for U.S. communities combating the lead hazards, there might never be any money from the group some say is most responsible for creating the problem: The companies that made lead pigment used in the old, flaking paint still coating millions of dwellings. The industry could be on the verge of defeating the last major legal assault by municipalities and states seeking damages to fund lead removal. Apart from one settlement, the industry has successfully defended roughly 50 lawsuits by states, cities, counties and school districts over the last 24 years. Now, in a bench trial under way in San Jose, Calif., the industry is seeking a final victory in a case brought by 10 public agencies, including the cities of San Francisco, Oakland and San Diego, as well as Los Angeles and Santa Clara counties. The suit seeks to force the defendants to inspect more than 3 million California homes, and to remove any lead paint hazards that are discovered, at an estimated cost of more than $1 billion. Lead lawsuits once were expected by some experts to follow the path of tobacco litigation. States that sued to recover smoking-related health care costs wrested a $248 billion settlement in 1998 from cigarette makers. As in the tobacco cases, public agencies in California and elsewhere hired private law firms, including veterans of the tobacco wars such as Motley Rice. The lead pigment industry, likewise has been represented by legal heavyweights, including top corporate defenders Jones Day and Arnold & Porter. The industry has been successful despite evidence that company officials knew more than a century ago that lead is hazardous, and industry advertisements promoted lead paint as healthy. In 1923, an ad in National Geographic from lead pigment maker NL Industries proclaimed: “Lead helps to guard your health.” The next year, an ad from a unit of paint maker Sherwin-Williams boasted: “Cousin Susie says her health improved instantly” after her home was covered with lead paint. Lead has been found in drinking water and in children’s jewelry, and has many industrial uses, but federal authorities say the biggest public health threat comes from lead-laden paint. Lead pigments were mixed into paint for decades, not merely for color, but also because they made the paint more durable and washable. The federal government outlawed lead paint for household use in 1978, however, due to its health hazards. This chart shows the national totals for the number of children tested and the number of those children found to have high levels of lead in their blood. The paint is still found on the walls of old houses and apartments, where children sometimes ingest it when it chips off walls and turns into dust. Although poor and minority children are considered most at risk, approximately 35 percent of all U.S. homes have some lead paint, and 22 percent have significant lead paint hazards, according to a 2011 survey by the U.S. Department of Housing and Urban Development. 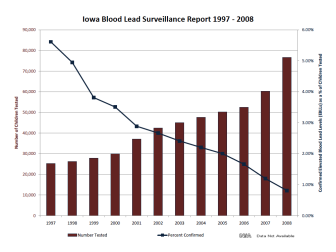 Public health authorities have made great strides in combating lead poisoning. But recent research has found that even small amounts of the metal can be harmful, which prompted federal authorities this year to raise their estimate of the number of children at risk. Young children with elevated lead levels in their blood are at risk of lower IQ, attention disorders and other problems related to brain damage. Although some individuals who sued landlords for lead poisoning have won settlements, lawsuits brought by public agencies against lead pigment makers have yielded only one success: In July 2005, DuPont agreed to pay $12.5 million to resolve a case brought by Rhode Island, which accused the industry of creating a public nuisance and presented internal documents showing that the industry had long been aware of lead hazards. The next year the state won $2.4 billion for lead abatement after a four-month trial against the remaining defendants. In 2008, however, the decision was overturned by the Rhode Island Supreme Court. But whose paint was it? Lawsuits against the industry have failed for various reasons. For one thing, individual plaintiffs claiming health damage from lead have been unable to prove that lead paint was the source. Some suits by public agencies have failed because they couldn’t prove which companies manufactured the lead pigment used in specific buildings and neighborhoods. Courts have rejected efforts to assign liability according to the market shares of the various companies. Other suits by government agencies that charged the industry with violating public nuisance laws were thrown out when judges ruled the laws did not apply because lead paint threatened individuals in their private homes, rather than the community as a whole. After marathon pre-trial battles, the California case has been allowed to proceed under the state’s public nuisance law. The defendants also say that California already has a well-funded lead poisoning prevention program that collects annual fees mainly from the gasoline industry, but also from makers of paint and other products. Presiding Judge James P. Kleinberg of Santa Clara County Superior Court has urged the two sides to settle, though the trial, which began July 15, is continuing. The California suit is only the third lead pigment case brought by public officials to go to trial since 1989. Back then, New York City officials pioneered the litigation, only to become the first of many municipalities to have their claims dismissed before getting to the trial phase. As in many other cases filed by public agencies, the defendants in California include Sherwin-Williams, the nation’s biggest paint producer, and DuPont, one of the world’s largest chemical companies, which in 2012 reported $9.5 billion and $34.8 billion in sales respectively. Other defendants are the Atlantic Richfield Company, or ARCO, now a subsidiary of BP; ConAgra Grocery Products; and NL Industries, formerly National Lead Co. The case was dismissed in 2003 but three years later California’s Sixth District Court of Appeals revived the suit and reinstated the public nuisance claim. Even before public agencies began seeking lead cleanup money from the industry, their struggles were foreshadowed by suits brought by private plaintiffs, including the landmark case known as Santiago v. Sherwin-Williams Company. Monica Santiago was born on November 9, 1972. From her birth until 1978, Santiago lived in a Boston apartment covered with lead paint. She was diagnosed with lead poisoning at the age of 1, after allegedly ingesting some of the paint on the walls of her family’s apartment. By July 1976, Santiago’s medical condition dramatically worsened. She underwent chelation therapy, a medical procedure that involves injecting chemicals that bind with lead, helping patients excrete the metal. In 1987, Santiago filed the first suit against the lead pigment industry, asking for $2.5 million in compensatory and punitive damages. The suit contended that Sherwin-Williams, NL Industries and others had manufactured and sold the lead pigment used in the paint in her home. That paint, the suit claimed, had not only caused lead poisoning, but later caused her to develop hyperactivity-attention disorder and motor skill difficulties. Yet in 1992 a federal court in Boston rejected the case, and an appeal also failed. Neil Leifer, a Boston lawyer who represented Santiago, took on the case after discovering documents in the National Archives that pointed to the industry’s early knowledge of the poisonous nature of lead. Those documents, along with related papers discovered later, have been used in cases against the lead pigment industry ever since. And as early as 1912, documents show, NL Industries excluded women and children from working with lead because of its known dangers, yet continued to manufacture it for use in homes. Donald E. Scott, one of the defense lawyers in the California case, said the early 20th century documents “describe lead-poisoning in workplace settings, like factories, from people consuming very large amounts of lead,” rather than household settings. Doctors, he said, spent many decades afterward trying to establish the toxic threshold for lead. Letters from the now-defunct Lead Industries Association in the 1950s also signaled that industry officials were aware of public health dangers. “With us, childhood lead poisoning is common enough to constitute perhaps my major ‘headache,’” Manfred Bowditch, health and safety director for the association, wrote in 1955. Bowditch elaborated on that point in a letter the next year to Felix E. Wormser, assistant secretary for the U.S. Department of the Interior, which was responsible for regulating mining and metal industries. Scott, the industry lawyer, called the references to slums and minorities, “callous and regrettable.” But Scott said some of the same documents show the industry was working hard to help children in the affected communities. Plaintiffs in the California lawsuit are continuing to present their case this week. The trial is expected to continue until at least late this month. FairWarning (www.fairwarning.org) is a Los Angeles-based nonprofit news organization focused on public health and safety issues. 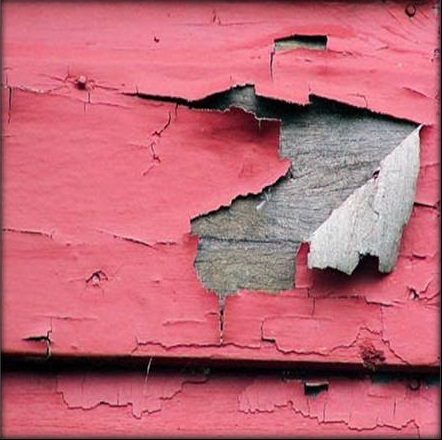 A California state court ruling against the lead paint industry broke the industry’s perfect record of defending suits by public agencies seeking to extract money for removal of flaking lead paint from older homes and apartments. Omaha-based ConAgra Grocery Products Co. is one of three defendants in the case, which resulted in a huge ruling involving cash.